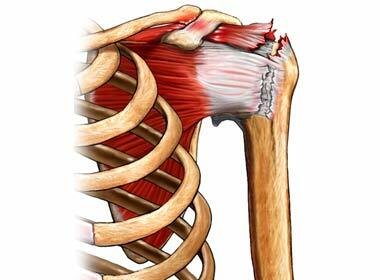 Rotator cuff injury may include tendinitis, strain, or tear of the rotator cuff. The rotator cuff is made up of muscles and 4 separate tendons that fuse together to surround the shoulder joint. You will be asked about your symptoms and medical history. A physical exam will be done, paying particular attention to your shoulder. You will be asked to move your shoulder in several directions. The treatment will depend on the extent of your injury, level of pain, and amount of immobility. The first step is usually a nonsurgical approach. Acromioplasty is surgery on the bony structures that impinge the rotator cuff. Surgery can be arthroscopic or open. A small instrument is inserted into the shoulder and used to remove bone spurs or degenerated portions of the rotator cuff tendons. Lesser tears can be repaired during arthroscopy as well. This combines arthroscopy with an incision in the shoulder joint. Through the incision, larger tears in the tendons or muscles can be sutured. This is used to repair the injured tendon or muscle in more severe cases. A tissue transfer or a tendon graft can be done during surgery if the tear is too large to be closed together. In the most severe cases, a joint replacement may be necessary. Depending on the extent of your injury, full recovery can take anywhere from 2 to 6 months or longer. Exercise regularly to strengthen the muscles around the shoulder joint. Rotator cuff tear. EBSCO DynaMed Plus website. Available at: http://www.dynamed.com/topics/dmp~AN~T114498/Rotator-cuff-tear . Updated February 16, 2017. Accessed August 24, 2017. 10/26/2010 DynaMed Plus Systematic Literature Surveillance http://www.dynamed.com/topics/dmp~AN~T114498/Rotator-cuff-tear : Massey T, Derry S, Moore R, McQuay H. Topical NSAIDs for acute pain in adults. Cochrane Database Syst Rev. 2010;(6):CD007402.